Accessible and dense at the same time, Skyzoo continues his growth as an artist by releasing one of 2012's best hip-hop albums on both a lyrical and production level. Skyzoo may just be the most accessible "über lyrical miracle" rapper since Ghostface's heyday. He's an MC that seems custom fitted for these times. His flow acts like a falling Tetris piece, locked into a constant rhythm and yet able to assume a myriad of forms on its way to the end point. The voice follows suit, with a nasally drawl that feels very Houston or Atlanta yet backed by a gnarled sort of urban confidence that could only truly resonate from underneath the corner store street lights of '90s Brooklyn. Being obsessed with the artform and the nuances of how much a great voice and delivery can push even subpar work into the spotlight, it's hard to convince myself that Skyzoo's nuanced delivery isn't the definitive bridge point between the new school's swaggering and the old school's dense formalism. And yet all signs point to the fact that he's not: The Salvation, for all its positives, was at times criticized for Skyzoo's sticking to script as a rhymer (again, I'd argue the appeal is in the subtle nuances within his template) and at others simply for not being what it represented, an underground album for mainstream heads. The release barely cleared five figures, which on a longstanding independent like Duck Down is a hard figure to measure as a bystander, but through a Billboard lens just feels like an unworthy number for someone whose style is so rooted in dangling upon the border between obscurity and radio play. A Dream Deferred appears on the heels of a pair of mixtapes, 2011's The Great Debater (admission: I never found time for it) and Theo vs. J.J., a release that was seemingly set up to display the differences between the aims of Salvation and Dream Deferred. If Salvation represented Skyzoo as Theo Huxtable, the rapper who knew success was just a rhyme and a beat away so long as his label supported his every move, then Dream Deferred is certainly Skyzoo seeing the world more from J.J. Evans' perspective, worried that maybe hope isn't enough to "make it through hysteria", though Skyzoo posits he's "made it through hysteria, [I'll] show 'em how" late in the album. But that doesn't mean the album is a notably somber affair compared to his would-be coming out party; in fact, to Skyzoo's great credit, this is an album that expands on everything that Salvation did well while folding on most of its more questionable decisions. In addition to a more focused effort on Skyzoo's part, the production is just on a whole different level. In part, this is because he's graduated from what's considered in the 21st century to be basic underground production to beats that bridge that void between boom bap and the grandeur that approaches larger artists like a J.Cole, Kanye West or Drake. Fans of Kanye West and Buckwild can coalesce here in equal measure, with about half the project guided by the steady hand of Illmind. The guy is just on another level here, for just one example the Late Registration levels of orchestral grandeur on the album opener "Dreams in a Basement". Or check how "Pockets Full" comes off as a Moment of Truth-era DJ Premier cut until its horn-driven outro without jarring the listener out of the vibe at all. Addressing production without looking towards Illmind's (who moonlighted during Kanye's Cruel Summer sessions) "Give It Up" would be an accident. This is a track that's so rooted in the odd, wobbly histrionics of dubstep while maintaining a very deliberate grounding in mid-'90s boom bap that it's amazing Illmind was able to hide this from Kanye's team. It's not the best track here, but for an army of hip-hop listeners that have wondered why density-focused artists like Skyzoo struggle to gain their shine they can now point to "Give It Up", claiming that this is a monument dedicated to both clubs and headphones with impunity. After collaborating in full with Skyzoo on 2010's Live from the Tapedeck, Illmind appears in front or in back of six of the fourteen tracks here, providing a guiding light for other producers like 9th Wonder, Black Milk, DJ Khalil and Tall Black Guy to follow. The message is simple: embrace your most marketable qualities, but don't be afraid to expand the boundaries of those formulas. Hip-hop fans who were entranced by Black Milk's 2008 release Tronic will have some familiar feelings throughout this album. However, even with all he's learned and all he's capable of, listening to Skyzoo certainly results in a feeling of impermeability. 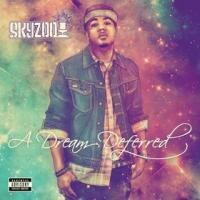 Even as he rocks increasingly ambitious production - and trust, Dream Deferred is one of 2012's great accomplishments - it's sometimes hard to get on Skyzoo's side as much as he seem tailored towards accessibility. He'll do the double back thing, where a line becomes a line within a triplet or a note becomes a pun, almost on impulse, as though he can't find a way out of a writing hole other than adjusting his word choice. And as subtle as his verbal display is, as region-abstract as I've presumed it can be, I'm not willing to argue it definitely is. The professionalism Skyzoo exerts, then, sometimes works in a minorly antagonistic fashion to the work he's presenting here as the increasingly amazing production and intricate rhyme schemes fall into place. As impressed as I am by Dream Deferred, to the layman's ear it could certainly feel like an album that's less impressive than it is, if only because one nuance or another doesn't fit where they think it should. But these are truly minor nitpicks, as the old adage goes that dense rhymes plus fantastic production equals out to spinning the LP over and over in order to decode the puzzle.